Adrenaline Rush | Where is Yvette? I realize I am terribly behind by now in this trip blog. Please address all complaints about the matter to the Case Western Reserve University Physics Department Graduate Program. Before anyone gets too confused, yes, this post is categorized under “Zambia” as well as just “Zimbabwe.” Why? 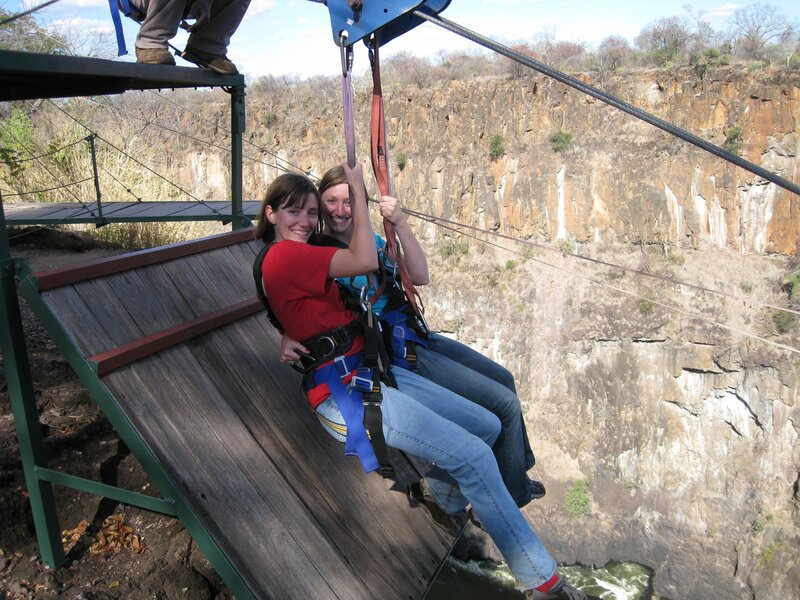 Because most of the adrenaline activities in Victoria Falls center around the narrow gorge the Zambezi River fills after the falls- about 100m high, filled with whitewater, and having Zimbabwe on one side and Zambia on the other. The dividing line is of course in the middle of the river so we technically have been to Zambia when we did whitewater rafting. We have just never set foot on Zambian soil! And jump we did- #2, the zipline! Had a bunch of experience with these in Laos and it was the only jump we could do together so we decided to, on the grounds that you go a lot further on a zipline if you have more mass. No guts required in jumping here as you’re sort of left to dangle and they do the letting go and hey, it was fun to have a sister to scream with as we flew above the gorge! Finally, the gorge swing. It should be noted that Linda is a much more awesome gorge swing jumper than I am because by this point the only other guy who had jumped before us screamed like a girl so I was thoroughly rattled- jumping off a platform is always a lot easier when you’ve seen a few people enjoy it in my opinion. 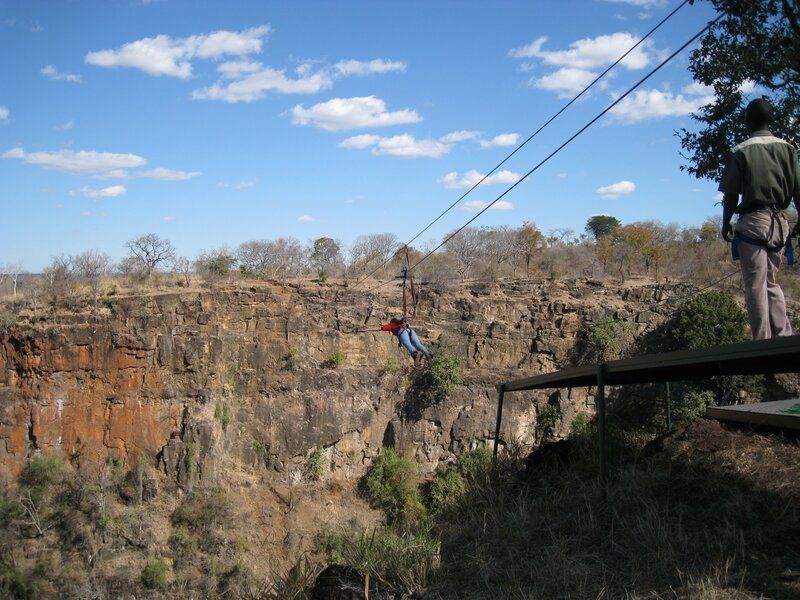 Anyway, a gorge swing is basically like a bungy jump but instead of bounces at the end you go into a huge parabolic arc after a 70m freefall in this case, which is actually more freefall than the bungy jump in Victoria Falls has! (Bungy jumps always just measure the distance to the ground from the platform but you obviously don’t actually want to fall that far, so the ~110m Vic Falls jump is considerably less than that.) And it was fun, really, except my neck was a little sore later from some whiplash when the swinging kicked in- the stuff we put up with for adrenaline! It should be noted that we did the course just at the beginning of high water season, when they only start from Rapid #11. In low season you start at the beginning of the course I really don’t think I’d enjoy that from what I hear- as YouTube can attest there are a lot of rapids where it’s a miniature waterfall, or your boat can get stuck as the rapid flows up, or a myriad of other things you wonder why people fork over good money to do. Before getting to raft, though, you need to climb down to the river! The gorge is about 90m deep and I for one was happy I had my Teva sandals and didn’t have to do it in flip-flops like many others, as some parts were quite slippery. So here’s our raft, practicing our paddling skills before the first rapid. I am the second person on the right side of the boat (behind a girl who spent a summer guiding whitewater rafts in Canada) and Linda was on the left. The surreal thing about calm stretches like these in the Zambezi is you are warned in advance not to fall in on them. Why? Because this being Africa there are crocodiles- we saw one sunning himself on a rock at some point- and while they avoid whitewater sections for the same reasons sane people do it’s probably best to not go for a swim in a calm patch just in case. And here is the part where we almost died. Kidding! No really, this was us on a Class 5 rapid called “The Washing Machine” which is quickly followed by the equally lethal Terminators I and II. Having so many hard rapids without a break made it the toughest stretch of the river by far- half the rafts in our group capsized, but ours emerged victorious! Hooray! And by emerging victorious I mean at some point the front half of our boat was completely underwater, we were crouched down and the water was over my head, so I suspect we were a lot closer to a proper capsizing than we dared consider. I confess though that after this I was left with a feeling of “that was it?” as far as my fears were placed- having done more whitewater kayaking than rafting in my life I suppose I was pre-biased towards the suicide that particular sport entails, and thanks to luck and general raft awesomeness we didn’t even capsize once! Last bit of adrenaline relished and numb from being tired, we then had to climb up the gorge again (all the while sending forlorn stares at the cable car the Zambian side is equipped with). But hey, we survived the part I was scared about! I guess it’s always important to face your fears, even when something like “crocodile-infested Class 5 whitewater African river rafting” is one of them. This entry was posted in RTW #1, Zambia, Zimbabwe. Bookmark the permalink.